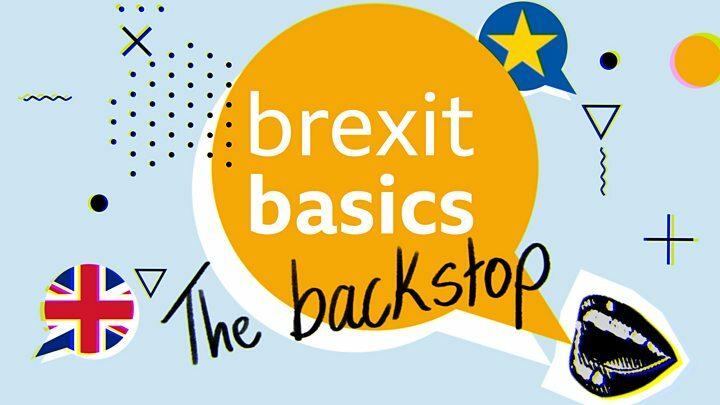 The backstop element of the Brexit plan is “not going to change”, Ireland’s deputy prime minister has said. The proposal – aimed at preventing a hard border between Ireland and Northern Ireland – played a major part in Theresa May’s deal being voted down by an historic margin last week. But Simon Coveney told the BBC’s Andrew Marr Show that the EU would not ratify a deal without it. Health Secretary Matt Hancock called the comments a “negotiating position”. Mr Hancock also denied reports that the government was “specifically” planning for martial law if the UK left without a deal – but he did not rule it out. Martial law involves the suspension of normal law, and temporary rule by the military. It can include measures such as curfews and travel restrictions. Could EU offer an extra ‘couple of weeks’? 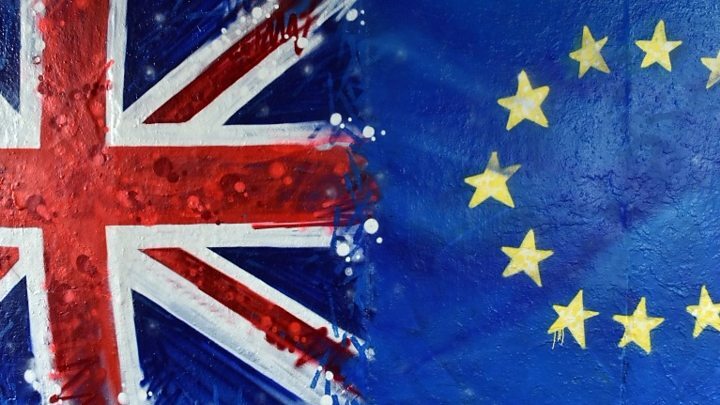 The UK is set to leave the EU on 29 March, with or without a deal. If a hard border comes about, people and goods passing between Ireland and the UK will need to be checked. Meanwhile, a leaked diplomatic note seen by the Guardian claims that the president of the European Commission, Jean Claude Juncker, has told Mrs May that to revisit the backstop issue she would need to agree a permanent customs union with the EU.  A customs union would mean that no tariffs would be put on goods travelling between the UK and the 27 member states of the EU, but that the UK could not negotiate its own trade agreements with other countries. The comments come ahead of a crunch week in Parliament. Mrs May will return to the Commons on Tuesday for a vote on her deal, which includes the withdrawal agreement – the so-called “divorce deal” on how the UK leaves the EU – and the political declaration – a statement on the future relationship. It was voted down by 432 to 202 votes last week, with hard-line Brexiteers in her own party and members of Northern Ireland’s Democratic Unionist Party – on whom Mrs May relies for votes in Parliament – citing the backstop as their main reason for voting against it. A number of MPs have been tabling amendments in a bid to force the government to change direction. 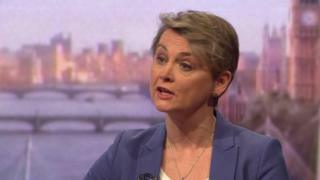 One amendment, put forward by Labour’s Yvette Cooper, seeks to introduce a bill that would allow the government to extend Article 50 – the mechanism by which the UK leaves the EU – by up to nine months in order to get a deal agreed in Westminster. Also appearing on Andrew Marr, Ms Cooper said she was not seeking to “block Brexit” and said the bill would be amendable – meaning MPs could vote on how long any extension would be. “We can’t carry on with a kind of game of chicken,” she said. “In the end, someone has to take some responsibility and say, ‘if the prime minister runs out of time, she may need some more time’. The UK is allowed to scrap Article 50 altogether – and halt Brexit – but to extend it, it would need the approval of the EU. But Mr Hancock said delaying Brexit would not help solve the arguments between MPs. “You can’t just vote for delay,” he said. “You’ve got to vote positively for a deal”. Other amendments being put forward ahead of Tuesday’s vote include a plan for putting a time limit on the backstop and another for scrapping it altogether. These are in answer to critics who dislike the backstop because they believe it keeps the UK too closely aligned to the EU and fear that it could become permanent. However, Mr Coveney said: “The European Parliament will not ratify a Withdrawal Agreement that doesn’t have a backstop in it. It’s as simple as that. 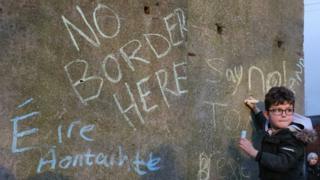 The former chief constable of the police in Northern Ireland (PSNI) echoed previous warnings that the return of a hard border between the two countries would become a target for dissident republicans. Speaking to RTE, Sir Hugh Orde said there would be no way to avoid security patrols if the UK left without a deal, and security officers would be “at risk”. Across Sunday’s newspapers and political TV programmes, politicians clashed over whether leaving the EU without a deal should remain an option for the government or not. Leader of the House Andrea Leadsom wrote in the Sunday Times that trying to rule out a no deal was a “thinly veiled attempt to stop Brexit”. But despite his colleague’s words, defence minister Tobias Ellwood wrote: “It is simply wrong for government and business to invest any more time and money in a no deal outcome that will make us poorer, weaker and smaller in the eyes of the world. Mr Ellwood also said members of his own party seeking to “crash out” without a deal “risk inflaming a dangerous battle for the soul of the Conservative Party” – saying it could determine the outcome of the next election. But Education Secretary Damian Hinds told Sky News no deal needed to remain on the table, although it would “not be a good outcome”. Media captionWhat happens in the event of no deal? 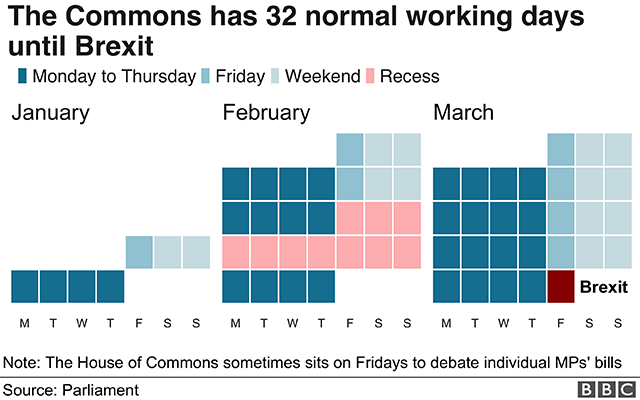 In other developments, the government is going to consult Parliament on whether to work extra hours and lose their February half-term break in order to get Brexit delivered by 29 March. BBC political correspondent Iain Watson said the government’s demand was a way of Mrs May sending a signal to MPs that she intends to stick to the planned March departure.